Christos, our Committee Contact, and Andrea, chairperson of the European Scout Committee, visited Finland from 2 to 5 May 2014. 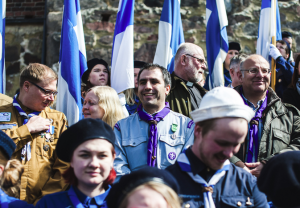 Apart from a series of meetings at our association’s head quarters in Helsinki, one of the highlights of the programme was certainly the participation at this year’s Partioparaati (Scout and Guide Parade) in Turku/Åbo. This event, which looks back on almost 90 years of history, is one biggest regular Scout and Guide event in the annual calendar of the South-western Region of the Guides and Scouts of Finland. 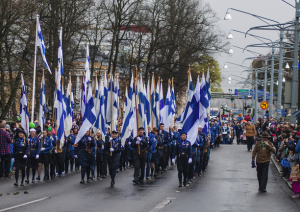 More than 4000 Scouts and Guides from all Groups in the region come together in Finland’s sixth largest city to celebrate and proudly display achievements during the past year, both a individual Scouts or Guides and as Movement in general. 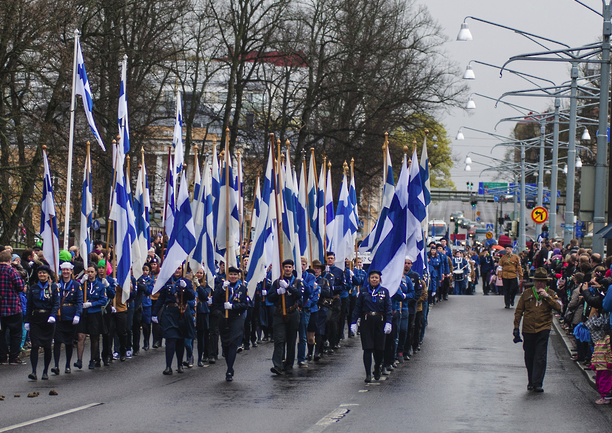 Even cold and rainy weather could not prevent yet another big party in the streets of Turku/Åbo watched by a large crowd of family, friends and representatives of local and regional authorities. The visit began on Friday (2 May) in an informal setting in Helsinki, when the International Commissioners met with Andrea and exchanged views on current themes in European and World Scouting. Similar discussions continued more formally on Saturday, by which time Christos had also arrived, with the International Committee and Board of the Guides and Scouts of Finland. 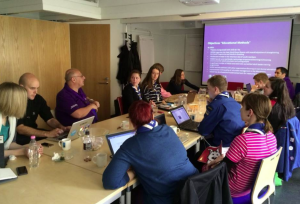 The focus of the exchanges was on the new proposed Vision 2023 of WOSM, and related strategic priorities. Later on Saturday, we all travelled to Turku/Åbo, where we were joined by Jørgen Rasmussen, chairperson of the European Scout Foundation, and attended a special reception hosted by the of City of Turku/Åbo. Two new members (Riina Aspila and Riikka Nenonen) and one new life member (Heikki “Hese” Tolvanen) were welcomed as Friends of Scouting in Europe (FOSE), the successful fund-raising scheme of the European Scout Foundation. The following day, Sunday, 4 May 2014, saw Andrea and Christos first participate in a meeting of the European Scout Foundation at the Sibelius Museum before moving on to join the Leadership of the Guides and Scouts of South-western Finland on the grandstand to review the annual Partioparaati and at associated festive gatherings of Scout and Guide Leaders. Informal discussions continued on Sunday evening when we returned to Helsinki on the train, which gave Andrea and Christos also a possibility to discover some of the beauties of the landscape of southern Finland. The last official part of the four-day visit was a meeting with the executives of the Guides and Scouts of Finland at the national headquarters on Monday morning.